Offering you a complete choice of products which include conventional induction heater, sprocket heating machine and induction annealing. Our clients can avail from us a range of Conventional Induction Heater that has heavy capacity to heat the components and is equipped with the latest technology micro controller based electronic control. This assortment of conventional induction heater model pih 2004 is equipped with manual or automated roll-sliding arrangement for the standard yoke 105 x 105 x 620 mm. To anneal a continuous feed of incoloy stainless steel tubing at 2000°F in a protective atmosphere with a quick cool-down, to eliminate need for additional sandblasting operation. A specially-designed 11-turn helical induction coil was utilized to provide even heat to the stainless steel tubing. After initial tests were conducted to establish time-to-temperature and heating profiles, a length of tubing was placed on a PacSci carriage in a protective atmosphere of nitrogen. The carriage conveyed the tubing through the induction coil at a rate of 1.4 inches per second. The 20kW power supply and carriage were activated simultaneously. Optical sensors monitored the temperature of the steel tubing as it passed through the coil, and at 100 inches away from the coil. The power supply was turned off as the trailing end of the tube entered the coil. 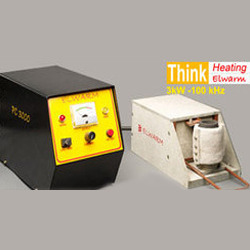 Induction Heating Equipment : 20 kW RF power supply, 11-turn helical induction coil with .8” O.D. 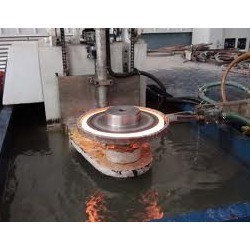 Looking for Induction Annealing ?